Roseau, Dominica – March 26, 2009………………On Friday, March 20, 2009, Minister for Public Works and Infrastructural Development, Hon. Rayburn Blackmoore, along with technical personnel from his Ministry, inspected the status of works on the Road Improvement and Maintenance Project (RIMP). From the Bath Estate main road to Silver Lake, work is continuing on the construction of sidewalks and drains and culvert extension. 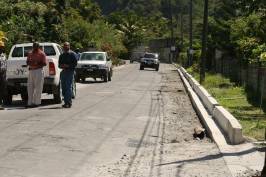 According to Mr. Ian Singh of Dipcon Engineering Services from Trinidad, the surfacing of the main road at Bath Estate with hot mix asphalt should be completed by the third week of April, 2009. Drainage work from Silver Lake to the Trafalgar junction is progressing and is expected to be completed in three weeks. Mr Singh added his company is hoping to finish the section from Bath Estate to the Trafalgar junction by the end of May, 2009, and then move beyond the junction to the end of the roadway. In Laudat, work is progressing on road widening to be completed in six weeks. Much Drainage work is expected to take place as well as additional excavation and the construction of a retaining wall at a particular section. The initial phase of the Back Road leading to St. Aroment involving significant excavation should begin in about six weeks. The road will provide for two-way traffic and will be surfaced with asphalt concrete. Meanwhile, Minister for Public Works and Infrastructural Development, Hon. Rayburn Blackmoore told the media at the site that the social impact of this infrastructural project is significant. Presently, seventy-five persons (75) are employed with another twenty- five(25) expected to be employed in the coming months as the scope of work on the project intensifies. Persons currently employed have a diversity of skills to include masons, carpenters, labourers, operators, among other specialised areas with wage rates ranging from $5.50 ECD per hour to $23 per hour. The Road Improvement and Maintenance Project (RIMP) was developed from a need to improve road standards through new construction and efficient maintenance. The value of the Works contract is in the sum of EC$23 million. The entire project is expected to be completed by the end of October, 2009.